Envisioning Harvard today as the go-to center of McHenry County may be difficult, but there was a time when it was all that and more. Celebrity guests included governors such as Adlai Stevenson, William Stratton (think McHenry dam), Dan Walker and Jim Thompson; secretaries of agriculture such as Ezra Taft Benson; U.S. senators who included Everett Dirksen, Paul Douglas and Charles Percy; athletic icons such as White Sox owner Bill Veeck and figure skater Janet Lynn; the daughters of presidents Lyndon B. Johnson and Gerald Ford; and presidential candidate John B. Anderson. No word on whether this year’s attendees will “feel the Bern” of presidential contender Sen. Bernie Sanders. But you never know. The final Democratic primary, in the District of Columbia, doesn’t occur until June 14. For years, Harvard arguably (perhaps a shade liberally) claimed the title “Milk Center of the World.” Its fiberglass mascot, HARMILDA, (short for HARvard MILk DAys) watches over the intersection of Routes 14 and 173. Its water tower boasts the image of a cow. 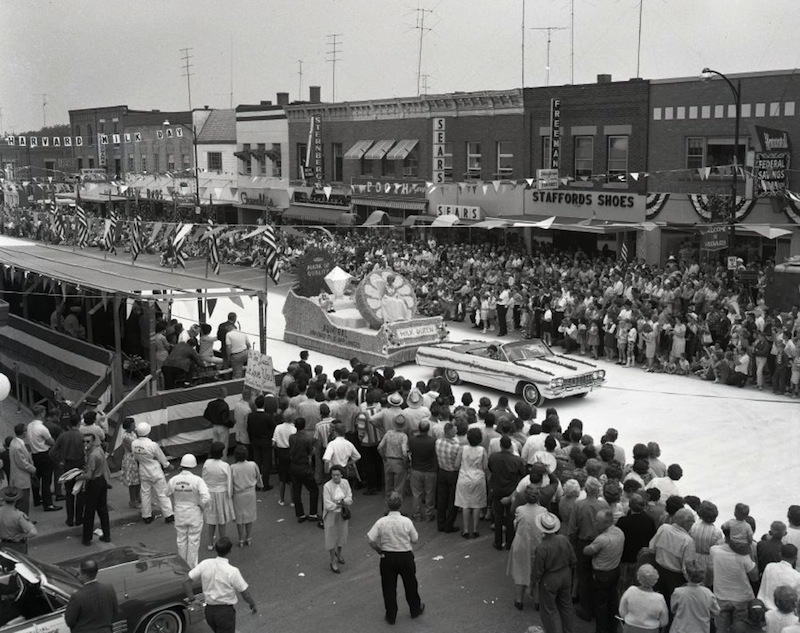 Dairies such as Bowman, Borden, Dean’s and Muller-Pinehurst sponsored floats, queen contestants and – of course – a milk drinking contest. At the 1955 festival, Bowman, Borden and Dean’s handed out more than 50,000 half pints of milk. After all, it was good advertising. The chamber of commerce reported that 12,000 people signed pledge cards promising to drink three glasses of milk a day. There even was a Dairy Diet Derby (say that three times fast) promoted by the Pure Milk Association, which began about a month before Milk Day. Civic clubs entered five-member teams that competed in a weight-loss competition relying heavily on milk. Perhaps it was tradition, or Americans’ fondness for chocolate chip cookies, that kept us drinking milk. A newspaper picture at the May 14 Milk Days Open House at Starline Factory in Harvard showed hundreds of farmers raising their hands and pledging to produce more milk. It was 1943, and the U.S. was at war. Marching bands were added in 1947, and not just from Harvard. The timing of Milk Days, back when most high school graduations occurred in mid-June, meant that marching bands – and later drum corps – from Illinois and Wisconsin participated in the parade and in a field competition. When school districts began adjourning in mid-May, the relationships that former Harvard band director Tony Cerveny had cultivated became moot. Gone, too, are things such as the tug-of-war contest, WLS National Barn Dance and “Dinner Bell” broadcasts, the Milk Maid Style Show, the old Harvard Speedway (Ayer Street and Route 173) and its harness races, and the hilarious antics of the cross-dressing Bob Rich, who walked the parade with his cow, Misty. The centennial Milk Days program boasted the Brothers of the Brush, in which bearded men vied for the best “mutton chops” and “Abe Lincoln.” Their counterparts, the costumed Sisters of the Swish, competed in a 100-yard race while flipping pancakes on griddles. Top that, IHOP! Still, plenty remains – from the bed and Big Wheel races to the cattle show, tractor show and fireworks display. The youth parade, milk drinking contest, Milk Run and prince and princess contest also remain fixtures. Alice (Nelson) Veldhuizen, now of Richmond, was the first little girl to be crowned Milk Days Princess in 1960. This year, her granddaughter, Addison, and grandson, Lucas, will don the traditional, ornate crepe papier outfits and compete for royal billing. The first Milk Days queen, crowned in 1945, was Norma Garrett Wittmus. She burst out of an oversized milk bottle. Nothing that dramatic nowadays, and nothing nearly so regional. When nearby communities began hosting their own festivals, Bannwolf said, pageants typically became part of them. That signaled the end of contestants from places such as North Boone, Big Foot and Alden-Hebron high schools. Life goes on. Milk Days goes on. If you haven’t heard Samuelson’s Ollie and Lena stories, you’ll get another chance this year. The Huntley resident and WGN radio icon will emcee a Milk Days Brunch at 10 a.m. June 4. Bannwolf, himself involved in some capacity with Milk Days since 1968, credited his team of about 150 volunteers and the city’s assistance for making the festival a success. By December, they come together again and begin planning the next year’s Milk Days. • Kurt Begalka is administrator of the McHenry County Historical Society & Museum in Union. For information, visit http://www.gothistory.org.